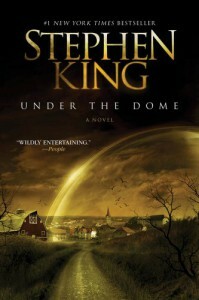 So, I've started "Under The Dome" by Stephen King. Yes, it's true, I've never read a Stephen King book in my entire life. Thrillers are not books I normally read. I occasionally venture outside my favored genres and many times am pleasantly surprised. I decided I needed to read a Stephen King book after I saw the movies, "The Shining" and "Misery." Both were awesome. And very scary. I know Stephen King is considered to be a wonderful writer and decided I needed to jump in and try him out. Have you read it? Do you like Stephen King's books? What do you like about them?